The AlphaESS SMILE5 home energy storage system is equipped with a “modulated battery and intelligent algorithm to maximise best performance”. AlphaESS, which was established in 2012, states that it “specialises in advanced battery storage products and intelligent energy management solutions for residential and commercial customers”, with its products available in a number of markets around the world. “With years of experience in both the clean energy and battery industries, the AlphaESS team helps families and businesses reduce their electricity costs and achieve energy independence through their own power generation, storage and optimisation,” AlphaESS states. AlphaESS states that its vision is “Your Smart Energy”, with the company “pursuing an ambitious goal of building an ‘energy internet’, where everyone can produce their own clean energy and lead a sustainable lifestyle”. AlphaESS, which has offices in Australia, Germany and China, has built a portfolio of energy storage systems, with the SMILE5 part of its Storion series. What technology does the SMILE5 use? The SMILE5 utilises lithium iron phosphate battery technology, with a depth of discharge of 90 per cent and a cycle life equal to or greater than 6,000 cycles. “The system identifies the on-grid output and adjusts the output power accordingly,” AlphaESS states. “It can also identity on/off-grid mode and automatically switch the modes. AlphaESS advises that the SMILE5 is compatible with new installations and retrofits (AC or DC-coupled), with it describing the SMILE5 as “sleek and elegant”. The SMILE5, which has an IP65 rating, measures in at 600 x 250 x 1,800 mm and weighs 180 kg. It has a five-year warranty for the whole system and a 10-year warranty for the battery performance. AlphaESS also provides a system configuration calculator via its website, which calculates a suggested system capacity. 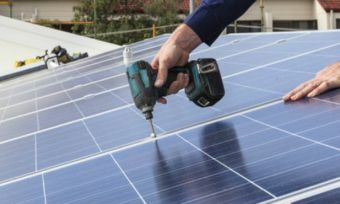 “This calculation is used to evaluate the required PV and battery system capacity based on your location, your quarterly electricity bill, targeted self-sufficiency rate and self-consumption rate, and estimated energy usage allocation,” AlphaESS states. An investment return calculator, providing a calculation “used to estimate your bill saving and evaluate the rate of return based on a future 20 years’ cashflow”, is also available. Interested in purchasing the SMILE5? Consumers interested in purchasing the SMILE5 can find further information via the AlphaESS website. You can get in touch with AlphaESS via phone or email, or by filling out a contact form on the website.